Now you can teach the whole class to use a compass and map at the same time. New portable version available, download to USB stick, use anywhere. Virtual Compass is a fully working simulation of a map reading compass, that you can project as large as you like onto a screen, allowing you to demonstrate how to use a compass to a large group. Students can follow your demonstration using a real compass and map, or by using the software themselves on the classroom computers. New portable version available for download. Use without installing, run directly from a USB memory stick, use offline with no need for internet access. Recommended: Computer with SmartBoard/Interactive White Board and projector, 40MB storage space for software on hard drive, network drive or USB stick. Minimum required: Computer with monitor visible to class/group, 40MB storage space for software on hard drive, network drive or USB stick. Recommended: Computer with SmartBoard/Interactive White Board, Internet Browser with Flash Plug in, Internet Access, and projector. None. 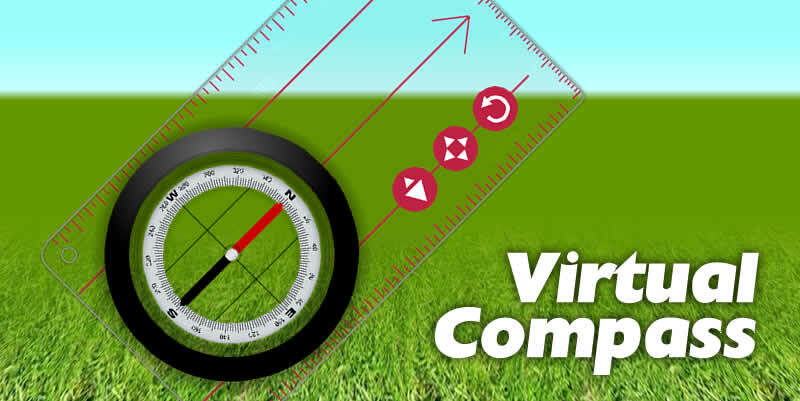 If you don't have enough compasses to go round, students can always use Virtual Compass on the classroom computers. The new windows download version allows you to import map images from your own computer quickly and easily. Supported map image file formats are JPEG, GIF and PNG. The download version does not need to be installed so you can use it straight away without needing to bother IT Technicians. The download version is portable, and can run directly from a USB memory stick. Just unzip the folder, open, and run. This button is found on the compass Baseplate. Click and drag this button to rotate the compass base plate on the screen. Click and drag this button horizontally to change the size of the compass on the screen. Drag left to shrink the compass on the screen, drag right to enlarge the compass on the screen. Click and drag any part of the Dial (or Bezel) to rotate it on the Baseplate. This button is found on the control bar at the bottom of the screen. Click this button to restore the compass to it's original position and size on the screen. You can demonstrate using the compass with any map image available on your computer in JPEG, GIF or PNG format. Or in the menu choose FILE > IMPORT MAP. Browse your computer and select a map image in either JPEG, GIF or PNG format. The image will load into the Virtual Compass. You can demonstrate using the compass with any map image available on the internet provided it is in JPEG format. A Google image search for "os maps" might be a good place to look. 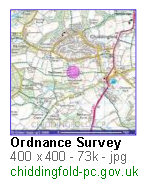 Once you have found a suitable map image in JPEG format, click the image thumbnail to go to the full size version. When the next page comes up, right click the "See full size image" link and choose Copy link location if you are using Firefox, or Copy shortcut if you are using Internet Explorer. Return to the Virtual Compass software and paste the link into the "ENTER MAP IMAGE" box. Then press the green download map button. Depending on how large the image is, and how slow the server or internet connection, it may take a short while for the map to load. If you have been waiting for more than about a minute, it may be that the image is no longer available online, or that it is not a JPEG, and you should try another image (it is a good idea to make sure the images you need are available in advance of the lesson). Future versions of this software will also allow you to select images from your own computer. Once the map image is loaded it will appear on the screen like this. This button is found on the controls panel at the bottom of the screen. Click and drag this button horizontally to rotate the map on the screen. Drag left to rotate anti-clockwise (or counter-clockwise), drag right to rotate clockwise. You can move the map by simply clicking and dragging the map itself. You can also use this button found on the controls panel at the bottom of the screen. Click and drag this button horizontally to change the size of the map on the screen. Drag left to shrink the map on the screen, drag right to enlarge the map on the screen. Click this button to restore the map to it's original position and size on the screen as it was when it was first loaded. In the "old" days we would have copied a map onto acetate and used an OHP to project the map and compass silhouette onto the screen. But these days OHPs are hard to come by (where I work anyway) and so an up to date alternative was needed. I love to develop interactive software in my own time, and this project has been one I really enjoyed. This is a great way of introducing the features and uses of a map compass to a larger group all together. Usually this can only be done in small groups because of how small the devices are. Virtual Compass solves this. There's no substitute for hands on experience, but that's not always possible. Students can also use the Virtual Compass software on their classroom or home computers if needed. 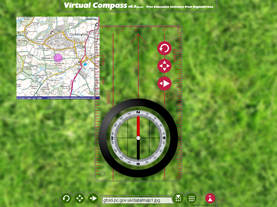 Virtual Compass can support teaching and learning for Geography, Uniformed Services, Cadets and Scouts. Any group that needs to learn to use a map compass.